SSRC is working with NASA and the U.S. 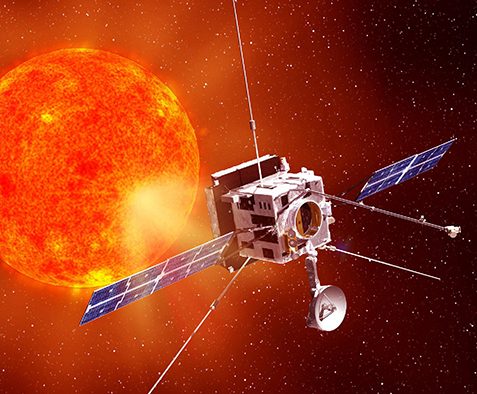 Naval Research Laboratory to develop the Solar Orbiter Heliospheric Imager (SoloHI) instrument for the mission, one of two scientific instruments being contributed to the ESA mission by NASA. SSRC is providing management & compliance support, life-cycle cost estimates, project management support, and System Safety Reliability & Mission Assurance (SSR&MA) for the SoloHI investigation. SoloHI will provide revolutionary measurements to pinpoint coronal mass ejections (CMEs). CMEs are space weather events with violent solar eruptions that travel from 60 miles per second to more than 2,000 miles per second with masses greater than a few billion tons. Launch is planned for 2017 from Cape Canaveral, Fla., aboard a NASA-provided expendable launch vehicle. SSRC managed the original proposal development for SoloHI for the U.S. Naval Research Laboratory, Solar Physics Branch. During the mission definition study phase, SSRC coordinated government scientists and contractors in the technical development of the SoloHI concept to address the research objectives outlined by NASA within the spacecraft resources provided by ESA.